Past Time Episode 24 - Dinosaurs and Crocs in the Land Before Egypt! Egyptian paleontology has a long and storied history, although much of it is focused on discoveries from the Cenozoic Era. Incredible fossils of early whales, primates, and other mammals have been discovered in Egypt since the beginning of the twentieth century, work that continues to this day. However, fossils from the Age of Reptiles are much harder to come by. Indeed, most of the fossils record of Cretaceous dinosaurs and their contemporaries were collected during a small number of expeditions in the early twentieth century by German paleontologist Ernst Stromer. 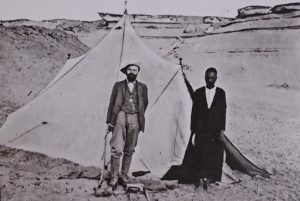 Ernst Stromer during an early twentieth century expedition to the Bahariya Oasis. The identity of his Egyptian associate is unknown. Please message us if you have any ideas! Stromer’s work focused on the “middle” part of the Cretaceous Period: between ~100–90 million years ago. Most of those discoveries—including the original type specimens of dinosaurs like Spinosaurus, Carcharodontosaurus, and Aegyptosaurus—were destroyed in bombings during World War II. For over sixty years, no substantive further discoveries of Mesozoic Egyptian fossils occurred. In the early 2000s, American paleontologists Matthew Lamanna and an international team returned to the Bahariya Oasis and discovered a variety of new dinosaurs, including a supergiant titanosaur Paralititan stromeri now housed in the Cairo Geological Museum. The Mansoura University Vertebrate Paleontology project highlighted in this episode extends those efforts into new fossil deposits into the Quseir Formation of the Western Desert of Egypt, preserving fossils from much later in time than those of the Bahariya Oasis. The Quseir fossils are some of the best records of terrestrial backboned animals from the end of the Cretaceous Period from the whole of Africa. This was also at a time when Africa was an island continent, isolated without land connections with other continents. That makes Africa prime real estate for finding unique fossil ecosystems. 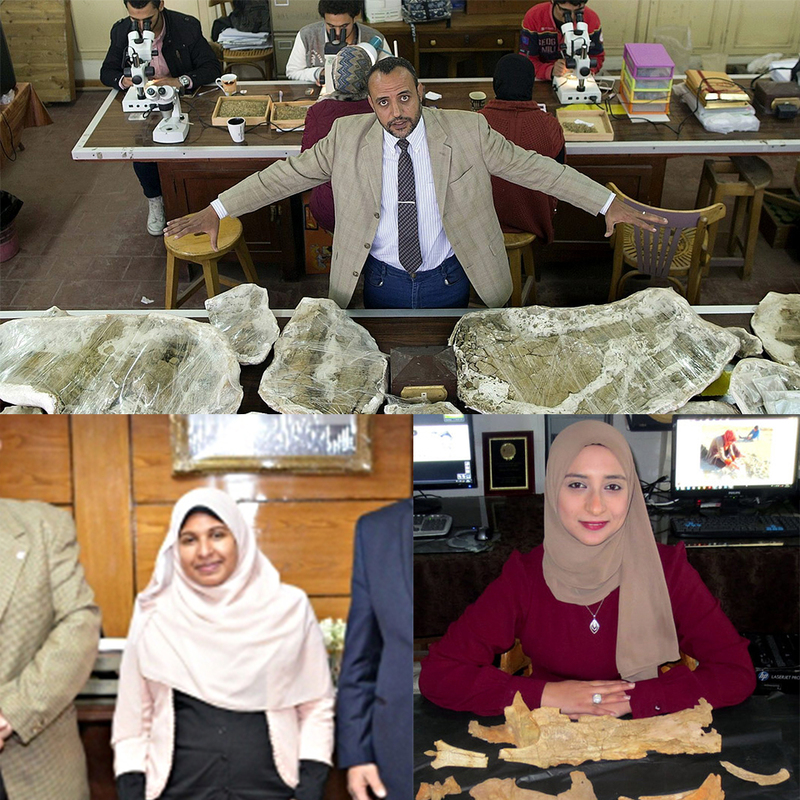 Dr. Heham Sallam leads the Mansoura University Vertebrate Paleontology (MUVP) team to the new frontier of vertebrate paleontology in Egypt. Educated at Oxford University, Hesham is one of the first native Egyptians to lead a scientific paleo project. He is training a large number of students in the science of vertebrate paleontology and Mansoura University. His current graduate students include Sana El-Sayed, Eman Abd El Aziz, and Sara Saber. Ms. El-Sayed holds the distinction of being the first woman paleontologist from the Middle East to lead a scientific publication, which described a giant catfish from the early Cenozoic. Sara Saber published the most recent MUVP paper describing the Cretaceous crocodile relative Wahasuchus, which is featured in this paper. The leaders of the recent publications out of the Mansoura University paleontology program. Top: Hesham Sallam, displaying the type specimen of Mansourasaurus. Lower Left: Sara Saber, who described Wahasuchus. Lower right: Sana El-Sayed, who described the giant Eocene catfish Qarmoutus. The award-winning MUVP team is not only developing field expeditions in the Western Desert and the Fayum Depression, but also the laboratory side of the process. The fossils of Mansourasaurus and Wahasuchus are housed in the collections of Mansoura University. There is a new fossil preparation facility, and the scientists have access to CT scanning technology as well. I am very excited to see more dinosaurs and all sorts of fossil beasts pulled from the Egyptian sands by this team. Left: Life reconstruction of Mansourasaurus by Andrew McAfee of the Carnegie Museum of Natural History. Right: A sampling of the fossil bones recovered from Mansourasaurus from the original paper by Sallam et al. A line drawing of the skull of Wahasuchus from the original paper by Saber et al. Blue bones include the original type skull. Green bones are based on additional specimens. The Mansoura University Vertebrate Paleontology website outlines the current work by the team. If you are a student interested in Egyptian paleontology, send them an e-mail! Sallam was interviewed about the progress of Egyptian paleontology in the past century by Daily New Egypt. Sana El-Sayid, who led the project describing a new catfish fossil from the Fayum Depression, was also interviewed about her experiences as a paleontologist by Discovery Magazine. Paleontologist and blogger Brian Switek outlined the nitty-gritty of the Mansourasaurus discovery in his Laelaps blog. The only good videos of the Mansourasaurus discoveries were a loooong series of interviews with Hesham and other Mansoura University paleontologists from Egyptian TV. Note that these are in Arabic. Egyptian folk music by Mohamed El-Sayed. Mansourasaurus call modified from Elephant sound effects by ULTRABROS123 (Youtube). Alligator bellow from astronomica via freesounds.org.